Will Grayson, Will Grayson by John Green and David Levithan. (Grades 9+) Dutton, April 2010. Copy purchased from my favorite local indie bookstore - Carmichael's. will grayson is depressed. his only "friend" is a somewhat annoying girl named maura who wants to hook up with him, but... will's gay. he can't tell her that, so he keeps on swallowing his pills, complaining about the world, and waiting for isaac to come online each night so he can come alive. isaac is the light in will's world. they've never met, but will lives for their online conversations. when isaac suggests that they meet, will is thrilled... but things don't turn out like will had planned. One fateful night in the city of Chicago, everything having gone wrong for both Will Graysons, the two of them will meet. And nothing will ever be the same. Internet, can I tell you a confession? I like John Green the person more than I like John Green's actual books. And, though I continue to read his books because he is adorable, I'm just not that into them. There are notable exceptions, though, and Will Grayson, Will Grayson is one of those exceptions. With two YA powerhouses at the helm, it's hard to see how they could have gone off course. The book's compulsively readable and both Will Graysons undergo a great deal of character development. In fact, each Will Grayson is getting to know himself, something that most teens can identify with. And now that I think about it, I think both Will Graysons are learning some of the same things - learning to stand up for himself, learning to take risks, learning to define himself in the context of friendships, and learning not to blame the world for not meeting his own expectations. They're both learning all of these things, but in different ways, on different paths. I guess I wish that Green's Will Grayson had been a little more fleshed out. I kept waiting to find out what had happened that was so terrible that he forced himself not to become attached to anyone. But maybe that's not the point. Maybe it wasn't something terrible that happened, but just all the little disappointments that pave one's life and really get to you when you're prone to angst (as some teens people are). More reviews: Libri Delectio, Voracious YAppetite, and Stacked (among others). 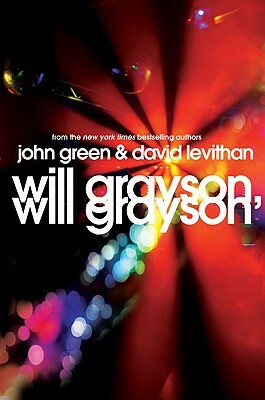 Will Grayson, Will Grayson is on shelves now! "I like John Green the person more than I like John Green's actual books." I agree with you 150%, though WGWG didn't do it as much for me as it did for you. Though, JG's part, I thought, was a nice departure from his other 3 titles for sure! I agree, too, that I like John Green the person more than books by John Green. That said, I've got this sitting on my dresser waiting for me. I need to read it! Okay okay! I WILL read it! I like John Green, books and person both. This bodes well for me because I'm in the same John Green boat. He's a pretty amazing advocate for YA lit but his books actually don't do much for me. Here's hoping I enjoy Will Grayson. I've been on the fence about reading this one. Coming of age type novels aren't really my style. But, I may just have to try it out. I actually read John's first book before John and Hank started vlogging. I like both all the same.